Answers to some of the most common questions & concerns. What data is required to quote? We have compiled a list of requirements which can be viewed at the link below. The list includes data requirements for both Layout and Manufacturing quote requests. Mentor Graphics Expedition, Power PCB (PADS) and Board Station: We currently support WG2004, EXP 2005.1, EXP 2005.3, EXP 2007 versions of Expedition, versions 2005sp1, 2005sp2 and 2009 of PADS and Board Station versions EN2002, EN2004, BSTN2005, BSTN2006, and BSXE2006. PADS 2007 is currently under evaluation for future support, please contact us for more information. Our headquarters are located at 20 Cotton Road, Suite 201, Nashua NH 03063 USA. We have a satellite office located at 17671 Irvine Blvd. in Tustin, CA and 2072 Sprint Boulevard in Apopka, FL. Our footprint has been expanding, and we also have employees located in North Carolina, South Carolina, Texas, Pennsylvania, Alabama, Montana, Kentucky, Maryland in the US, and also in Ottawa and Vancouver Canada. What do I need to get started with FCS and get a quote? The most up to date list of requirements for quoting layout, engineering, and turnkey manufacturing can be found at the link below. How do I exchange my data files? We invite everyone to create an account on our secure and encrypted ShareFile System. It is very easy to use and facilitates faster data transfers. Please request an account at the following link, during normal business hours you should receive your login information within 1 hour. Creat an account at the link below. I can’t access ShareFile to upload a file. Do you have an alternative process to Share File, such as an FTP site, to transfer data? What if I need to make changes one the design has started? Once your design has started, changes can be made by emailing them to the Operation Team at ops@freedomcad.com with a new scope of work. This will insure that the changes are implemented and, if need be, re-quoted and/or re-scheduled. Do you perform a Design for Manufacturability (DFM) check of your designs? We run Valor’s Enterprise 3000, performing over 700 different DFM checks on every job we do. Processing each job through Valor assures all DFM requirements meet your specifications, and it minimizes the transition to the manufacturing process. You can supply your own Engineering Rules Files (ERF), or you may specify your Fabricator and we will take care of the rest. What does Freedom CAD provide as data output? We provide a set of industry-standard deliverables for fabrication, assembly and test, but can customize to your company’s standards and naming conventions. PADs and Expedition outputs are similar. Does Freedom CAD Provide quick-turn layout support? We are staffed for two shifts daily on all of our design tools. This enables us to provide quick-turn support on time-sensitive projects. We also have the ability to provide 24 x 7 layout support when a project demands extreme measures. Please contact us if you have a hot project that requires quick-turn layout support! What Auto-routers does Freedom CAD use and how do you use them? The routers we utilize are the Cadence Spectra router and the Mentor Destiny router. In general, auto-routing is done to help expedite the job only after all the critical circuitry has been hand-routed and locked down. In many rules-driven, highly constrained boards, 50-80% of the board may be critical and need to be hand routed. Like all tools, auto-routers have a place and time for their use. We utilize them for up front test feasibility routes to determine layer count and hot spots. And we utilize them when the customer would like to hand route just a few critical circuits and then go for a first-pass to test the board. We understand the importance of Intellectual Property and take all Non-Disclosure Agreements very seriously. We hold our employees to very high confidentiality standards. Customer data at Freedom CAD is backed up on a secure system. When the time comes to archive a project, not only does the customer receive a copy but we also archive a copy and lock it in an off-site fireproof safe for retrieval if necessary. Our ShareFile system for transferring data uses bank-level security and above. All active transfers of data are encrypted using 256 bit SSL (Secure Socket Layer). Files are stored with 128-bit RC4 encryption on SSAE-16 compliant servers. Freedom CAD also employs a Disaster Recovery Plan that covers us with a complete pro-active approach to any disaster, allowing us to be up-and-running in 24 hours with minimum impact to our customers’ schedules. Ask us about it. What set of standard does Freedom CAD adhere to? FCS’s default standard is IPC. Our mode of operation is to design to your standards. Your standards will be adopted and conformed so as to insure seamless interaction with your in-house resource and down-stream manufacturing. If you do not have standards, we will help guide you in the latest standards. What are the other services that Freedom CAD offers? Freedom CAD recognizes that the challenges facing our industry today are Time, Technology and Cost. To support our customers, Freedom CAD offers critical value-added services through strategic partnerships with world-class companies. Our goal is to save you time and money while delivering you a quality product. PCB Fabrication: Freedom CAD works with fast-turn industry leaders to meet your fabrication requirements. Our program managers have in-depth knowledge of the PCB fabrication business. Combining this knowledge with our proven design process and tools allows us to bring your products to market sooner, with less rework, and at a lower price. PCB Assembly & Test: Almost every product needs some level of assembly to be useful in its intended function. We have the ability to support your needs whether you want to provide the kitted items for assembly or have us provide a complete turnkey solution. What does Freedom CAD base design charges on? Fixed-price designs are a simple way to compare one design house to another if price is the bottom line. Should the scope of work change significantly during a fixed-price design, the job may need to be re-quoted; change orders to a fixed-price quote will be evaluated on the individual basis. Minor tweaks and edits are assumed, and should not change the price. Hourly quoting is usually done when the project is expected to have concurrent engineering edits or other changes as the design progresses. These quotes can be generated on a “Not-to-Exceed” basis or on a budgetary estimate basis, depending upon the completeness of the data supplied to us at the time of quotation. 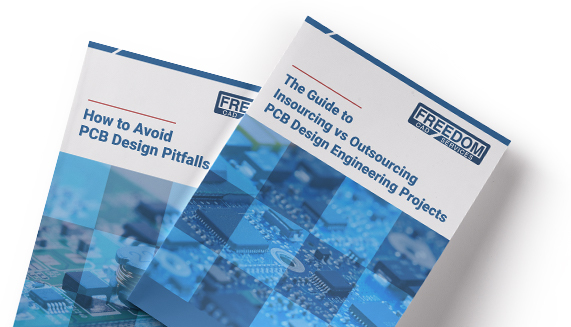 What's the benefit to outsourcing my PCB layout to Freedom CAD? Our philosophy on this is simple: we work hard to make the outsourcing model work for you. Without outsourcing, you take on the challenge of adding and balancing many liabilities/costs. During peaks, you hire, train, manage and outfit your in-house team with expensive tools. During valleys, you may need to lay-off designers and continue to pay for idle licenses and overhead. By outsourcing with Freedom CAD, you save the tangible and intangible time and money required to sustain an extended full in-house design team, all the while getting fast, professional results from an outstanding team that acts as an extension of your engineering department. What differentiates Freedom CAD from the competition? Our people are our company. The people we employ are hand-selected and understand our mission and goals clearly: service and quality on time. We are well versed in rules-driven, highly constrained, high speed, analog, power supply, military, medical and RF design technology, to name a few. We run on the Cadence and Mentor suites – the two highest-end design software companies in North America. The scale of our operation allows us to take on large, multi-board projects with ease and keep them on-time, even when extensive changes occur. Our strategy is to be an extension of your engineering team and seamlessly augment your in-house design team. We take a teamwork approach toward projects, making sure that we align the right designer with the correct technology to meet your needs. We create teams for complex projects and match 1st and 2nd shifts to expedite work when you request faster turnaround. When 1st and 2nd shift is not enough to meet your time line, we have the ability to run 24 x 7 for as long as it takes to complete your project. This is not out of the ordinary at Freedom CAD; on average we have several requests per month and execute this process fluidly. Our designers participate in training and information sharing on a weekly basis, keeping them up to date on the latest technologies, techniques and software. This allows us to efficiently execute your design. As a general rule, in-house design teams do not have the luxury of this kind of training investment. We are committed to operating on advanced software suites and leading-edge hardware that take advantage of automation and fast processing speeds so we can efficiently complete your designs in minimal time. Again, because design is all we do, we take added steps that most in-house teams cannot. What does it mean to be a Cadence early adopter program member? “Early Adopter Program” members are given access to Cadence’s newest PCB design software revisions six months before their formal release. This early access enables steeper learning curves as the Program Members are provided extensive training by Cadence during this beta phase. As a result, we are often able to help our customers make their transition to these new tools more efficient by sharing our experiences and offering structured training classes when appropriate. I don't own a license for the design tool. How can I audit the layout to make sure it's meeting my expectations? The CAD tool developers typically offer “Free Viewers of Browsers” to enable viewing and often marking up the design. They may also offer viewers with even more capabilities for a nominal cost. Cadence’s The Allegro Physical Viewer is a database viewer for Allegro PCB Editor, Allegro PCB SI, and Allegro IC package solutions. Allegro Physical Viewer includes all of the features of Allegro FREE Physical Viewer plus property and element query, measure distance, find, reports, and more. Have a question? Give us a call and we’ll be happy to answer them. Fill out the below form and we should get back to you within a few minutes during business hours.